On late Sunday afternoon, September 30, 1894, Puyallup City Marshal William Jeffery was walking home after visiting his blind mother in Alderton accompanied by Thomas Alexander and Thomas Bouley, both employees at the Pacific Meat Company packing house in Meeker. As the three arrived at Meeker Junction, Marshal Jeffery spotted two men jump from a passing train with a bundle in their arms. They ran to a vacant building where they stashed the bundle inside. After the two suspicious men left, Marshal Jeffery walked over to the vacant building, located the bundle and began looking through it. It was a rolled up overcoat that contained a black slouch hat, a false beard and moustache, a cartridge belt and a .45-caliber Colt Single-Action Army Revolver in the holster. As Marshal Jeffery was going through the items, one of the men returned and told Jeffery to put the gun down. 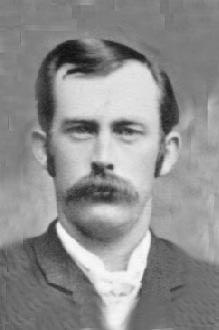 The man was Thomas Blanck, one tabbed the “Jesse James of the Pacific Northwest,” for his ruthlessness in the way he kills and his ability to escape from law enforcement. As Jeffery was still looking at the gun, Blanck drew another revolver and shouted, “Hands up!” Blanck then fired a single round that struck Marshal Jeffery in the right side, passing through his lungs and heart. He died at the scene. Alexander and Bouley witnessed the shooting from a distance and telegraphed Pierce County Sheriff Alexander Matthews in Tacoma about the murder. Within an hour, Sheriff Matthews and more than one hundred additional special deputies arrived to hunt for the killer and his accomplice. A manhunt ensued over the next day. It was unknown who the suspect was at the time, but Blanck wounded a Pierce County deputy near the McMillin junction around 0200 hours on October 1. Around 1200 hours, the accomplice, 15 year-old Franklin McMurray, was arrested in a café near the train depot in South Prairie. He immediately confessed to the murder of Marshal Jeffery, but witnesses discounted his confession as he didn’t match the description of the shooter. Blanck escaped to Seattle where he murdered a bartender before being captured. He was eventually convicted of murdering Marshal Jeffery and sentenced to hang. His conviction was overturned by the Washington State Supreme Court and while awaiting a new trial he escaped from the King County Jail on March 17, 1895. At about 1600 hours on March 21, Blanck was shot and killed by King County deputies near Orillia after a shootout. Marshal Jeffery had served with many different local and federal agencies during his career. He is survived by his wife and three children.